What sort of grants does the Council offer? Cullompton Town Council has a small budget each year to provide financial support to local groups, projects and events. The Council will look at each application on its merits, but will expect you to show how the money will benefit the community. You should also show that you are making reasonable efforts to raise your own funds. The Council will need to be satisfied that your organisation will use the money effectively and that it is well managed. If the application is successful, the Council will expect its contribution to be acknowledged in any publicity about the project. Town Councillors may wish to visit the project/scheme and the Council will require written feedback on how the grant was spent and how it benefited the community within six months. Failure to comply may result in future applications being rejected. Grants are not usually awarded for money making or sales ventures but this may be relaxed in exceptional circumstances. The Council may decline grant applications from groups or organisations that have made a successful grant application in the previous year, or on a regular basis. 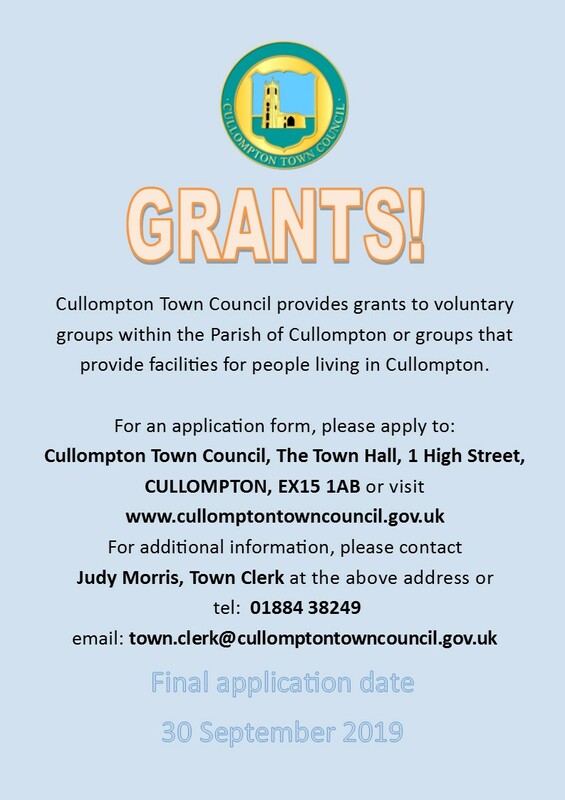 Any organisation based in Cullompton and/or providing direct benefit to residents of Cullompton parish can apply to the Town Council for a grant. Grants to national organisations will only be made to local branches where the grant can be seen to directly benefit Cullompton residents. The law does not allow the Council to give grants to individuals. Applications are considered in April and October (only if funding remains following the April round) and completed forms must be returned by 1 April or 1 October. Application forms are available from the Town Council office or by clicking the link. Read these Notes and the application form carefully to ensure that all the information is provided. If you are in any doubt, contact the Town Council office and ask for help or guidance. Complete the form and return to the Town Council office, at the address above, together with a financial statement for your organisation (preferably the most recent audited or certified accounts). In exceptional circumstances, mid-year applications may be considered at the discretion of the Policy, Finance and Personnel Committee. The Council will also consider making grants towards the cost community events. As these grants will be considered by the Community Wellbeing Committee and paid from a different budget line then the Council will accept applications for a grant towards the cost of staging a community event at any time. All grants are considered on their merits by the Policy, Finance and Personnel Committee which will meet in April and October to consider the applications, unless it is an application for a grant towards the cost of staging a community as per above. The recommendation of the Resources Committee will then be placed before the Full Council for a decision. If you wish, you may attend the meeting to listen, but not take part, in the discussion. However, a public question time is permitted at the beginning of all town council meetings. Your application will be acknowledged and we will tell you the date of the council meeting at which it will be considered. We will contact you as soon after the meeting as possible, to let you know what has been decided. Successful applicants will then either be sent a cheque straight away or proof of expenditure may be requested before paying the grant. If a group or organisation decides that they would like to use the grant for any purpose other than that specified on the application then it must first obtain the consent of the Council. Please do not forget to include a Financial Statement for your organisation and please note the closing date for applications on the form.